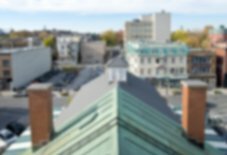 Saint-Hyacinthe once again confirmed its standing as city of business and entrepreneurship, ranking 6th in Quebec and 12th in Canada for its entrepreneurial dynamism in the Canadian Federation of Independent Business’s annual Entrepreneurial Communities study. Saint-Hyacinthe stood out among the 125 communities studied in Canada and even reached the first step of the podium for cities in southern Quebec and the Greater Montréal area. It was also in the top 10 mid-sized cities (fewer than 125,000 inhabitants) for its entrepreneurial perspectives, meaning that it is home to the most prosperous businesses that are the most optimistic about their potential for growth. Saint-Hyacinthe has held its position among the Canadian cities with the highest entrepreneurship index. This ranking takes into consideration the businesses’ and economy’s different growth indicators, development perspectives, entrepreneur confidence and the community’s regulatory and tax policies concerning business creation and operation. Saint-Hyacinthe continues to score high on these indicators.